Though winter feels unbearably long, blood orange season always seems to pass in the blink of an eye. 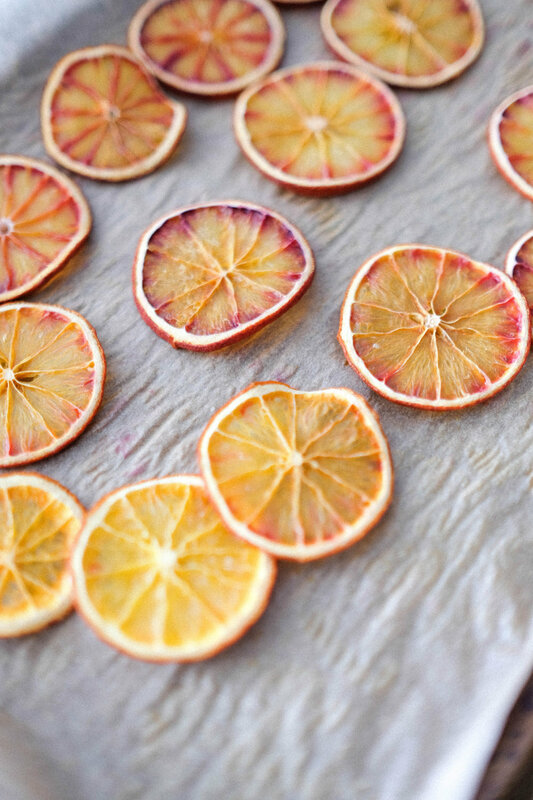 Perhaps it's because these sweet, colorful, citrus beauties grace us with their presence as the new year is unfolding and leave just before spring has sprung—just the time when we are eagerly anticipating a new start. Unlike other oranges, which show up on grocery store shelves year round, it is said that blood oranges require cool growing temperatures at night to develop their signature crimson or dappled red hue. 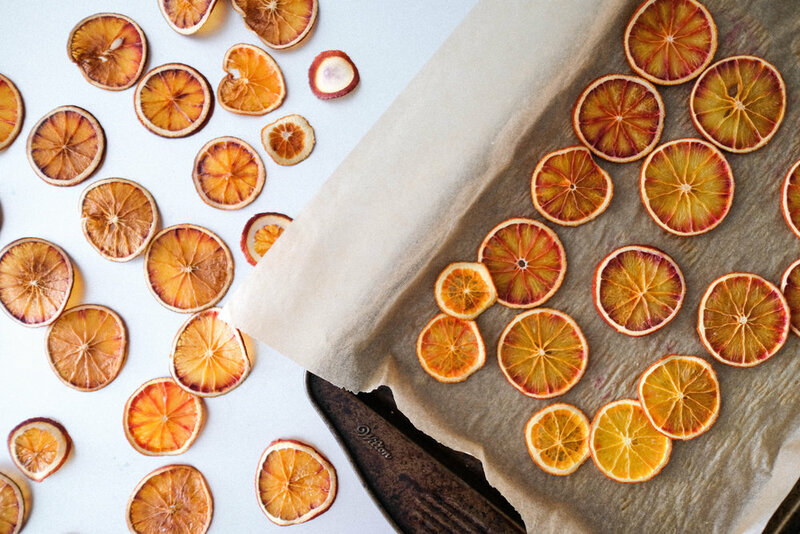 Dehydrating blood oranges is a great way to capture and preserve the unique flavor and color of these fleeting fruit. Once all the moisture is removed, they can be added to homemade tea blends, used as a tasty and eye catching garnish on a cocktail, and combined with flowers and spices to make a fragrant potpourri (seriously, we need more potpourri and less febreeze these days!). 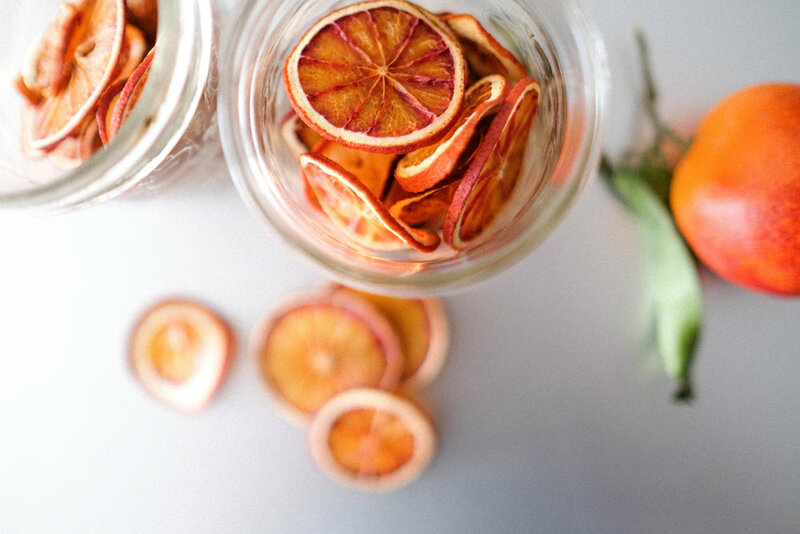 What is more, if we dehydrate our blood oranges in the oven for long enough we'll be left with crispy, sweet, and tangy chips—perfect for snacking or serving alongside a shot of espresso. Coffee fruit, blueberries, concord grapes, blackberries, red cabbage, autumn leaves, and eggplants all have one thing in common with blood oranges: anthocyanins. 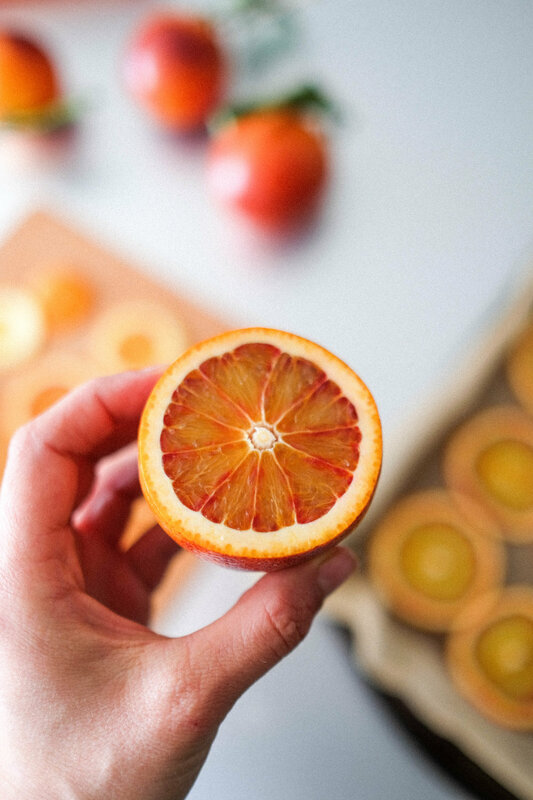 Anthocyanins are responsible for the unique color of blood oranges but also are said to have antioxidant and anti-inflammatory properties—potentially making a blood orange a better nutritional choice than a typical orange, orange. The blood orange is said to have been first cultivated in Sicily in the 9th and 10th Century. Today we can find blood oranges growing in Italy, Spain, California, and throughout the southern U.S. citrus growing regions. The oranges you are looking at in these photos were grown in Spain and are of the variety Sanguinello. Sanguinellos have distinctive orange to red ombré peels and a ruby speckled flesh. They are perfectly suited to dehydrating because of their relatively thin rinds. Two other blood orange varieties of note are the Moro and the Tarocco. The Moro has a uniformly yellowish skin, with a deep maroon interior, while the Tarocco, is said to be the sweetest and most flavorful, with the least amount of color variation inside and out. 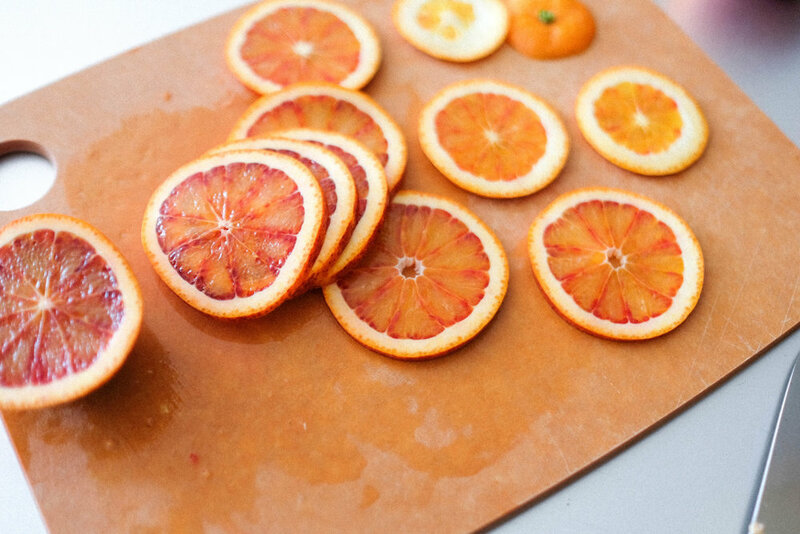 Whatever the variety, slicing open a blood orange is always a sensory delight. Thoroughly rinse blood oranges with hot water or fruit wash to remove any dirt or residue from peels. Pat dry. NOTE: once the moisture is fully removed from each slice, they will be very quick to brown in the oven. If you'd prefer the oranges to maintain their vibrance, you need to keep a close eye on them (see example below). A browned blood orange slice may not be as pretty, however if dry enough—closer to 2.5/3 hours—you can eat these browned slices like chips. Yum! Check in again at 2hrs and 15 mins. Now is the time to keep a close eye on your slices in order to achieve your desired end goal. As it's nearly impossible to have all the slices dry at the same time, you will need to keep removing some from the oven, while flipping others over over as needed. Without moisture, microbes (or microorganisms), like bacteria or mold can't grow and cause our blood oranges to decay. Although the simple act of drying food using heat, smoke, wind, or the sun, has been employed by humans for tens of thousands of years, today some commercially dried fruit products contain added sulfur dioxide. Also known as sulfites, sulfur dioxide helps keep the preserved fruit's bright color intact (think dried apricots). However, studies show that these chemical additives can induce asthma when inhaled or ingested by sensitive subjects. If you are buying dried fruit in the grocery store, be sure to read the label, or opt for the less pretty dried fruits which have browned. Ultimately, dehydrating is a great way to preserve fruit and vegetables. The best part is that we don't need fancy equipment, just an oven, a sharp knife, some time, patience, and curiosity. Also, preserving food is empowering—it doesn't require chemical additives to achieve a beautiful, shelf-stable product, and this reminds us of our autonomy. Because only slow food can teach us the things that really matter - care, beauty, concentration, discernment, sensuality, all the best that humans are capable of, but only if we take the time to think about what we're eating."